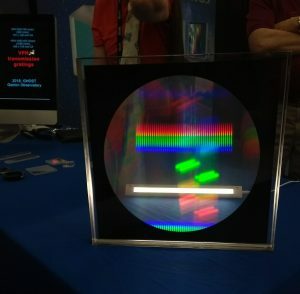 Figure 1: a pretty diffraction grating spotted at the SPIE exhibition. 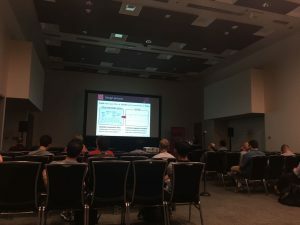 Inspired by the daily reports from the recent AAS summer meeting (start here for recaps of days 0 and 1 but do check out all days), I set out to cover the conference and report lots of exciting science to you all. However, it turns out trying to summarise a week of exciting science is a bit too much for one person to do. So instead, for my astrobite today, I’m going to share some of my experiences from the conference and hopefully provide some pointers for if you’d like to attend in 2020. The most important piece of conference advice I’ve been given is don’t go to everything! Thanks to SPIE’s parallel sessions, this is physically impossible but does mean you’re spoiled for choice and it’s hard to not want to go to a talk at every given opportunity. Following on from Caroline Moreley’s bite on attending conferences, and to help avoid tiring so quickly, do try to plan ahead of time what talks you’d like to go to, and what posters you’d like to see. Not only can you be smart and think of questions beforehand, this strategy also allows you to meet potential collaborators and generally use your active conference hours more efficiently. However, this is something I failed miserably at because I got very enthusiastic about talks on Sunday and Monday, and by Tuesday, the day my conference stream started, I was already starting to struggle to engage fully with the conference. I love travelling to new places, checking out a new town and meeting interesting people…but I also despise it. Being in an unfamiliar place surrounded by unfamiliar people can be exhausting and overwhelming, so something I found beneficial was returning back to the same cafe several times. This might not suit everyone, but having a go-to spot, finding your home from home, means you always have somewhere to go if the conference gets too much. Going for a walk is also a great idea, but in the hot and humid Austin weather, this was not something always manageable. Figure 2: my go-to safe place for lunch, coffee and to just generally relax was overlooking a beautiful lake. Back in February when I heard my abstract had been accepted for a talk, I was thrilled. Little did I realise how tough it was going to be because, unfortunately, my talk was scheduled for the particularly unappealing, last day of the conference, slot. This was a non-ideal situation for two reasons, the first being I had all week to panic about my talk, so it detracted from my overall conference experience. Moreover, by the time Friday arrived, I was tired. A week of talking about science and absorbing as much material as possible had really taken its toll. I’m not sure what can be done to avoid this, but do keep this in mind when attending Friday talks – be supportive and try to stick around for them. These days, most conferences have a hashtag and #SPIEAstro was no different. Between live-tweeting, getting recommendations for coffee and quickly discovering who else might be at the conference, Twitter is a really useful tool. At least during the first few days, I attempted to tweet during talks about some of the cool things being presented. Beyond obvious benefits like improving science communication skills, I found it a really useful way to document some of the talks, absorb content and recall things afterwards. Furthermore, if you find a lot of interesting people to follow at the conference, it makes it really easy to keep up with what they’re doing until the next one. So, I talked a lot about how tiring I found the conference but honestly, overall, I had an excellent time at SPIE Astronomical Telescopes and Instrumentation. I met wonderful people, saw outstanding science presentations and also got to visit the states for the first time. But, my main takeaway from this post is the importance of treating a conference like a marathon, as opposed to a sprint, as I started to flag way too early in the week. On the whole, my experiences are not unique to SPIE and neither are the tips. Thus, if you have any pieces of advice on how to survive big conferences like this one, please feel free to share in the comments below. UPDATE: In case you missed it, Samuel Factor attended the conference as a non-instrumentalist – do check out his bite here.